Explore, embrace and connect to the five elements. I have found some very helpful tools throughout my twenty-five years of yoga practice. One of my favourites is the methodical, systematic and constant approach to the five elements: Earth, Water, Air, Fire and Ether. Each one of these elements forms a part of ourselves. They are in us and we can indeed learn to use their innate wisdom and qualities for the fulfilment of our goals and desires. Learning to work with them through the breath, through movement, through the connection with the chakras, through visualisations and active meditations is an art. 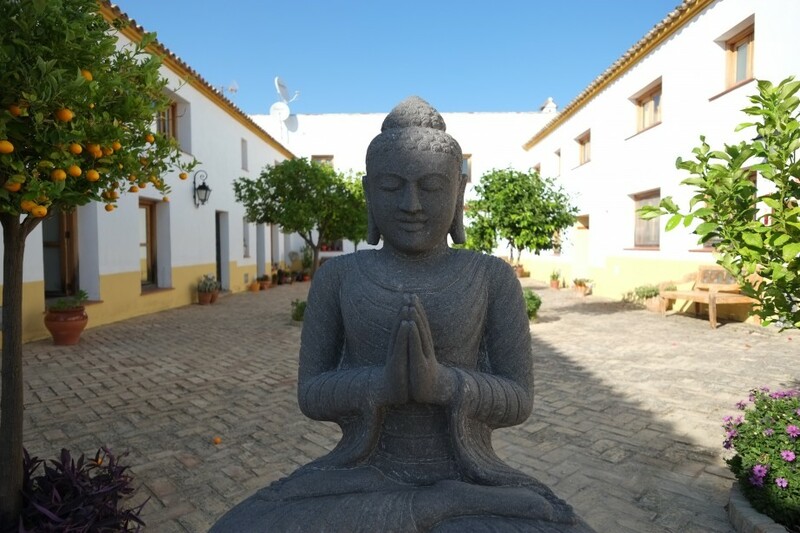 In this beautiful yoga retreat centre located in the stunning country side of Andalucía, we will have the opportunity to fully embrace a practice twice a day. In the mornings we will find the stillness of the earth, we will flow with the wind and the waters, we will connect to the fiery sun that shines strongly even in October, and we will find spaciousness within. Each day will be dedicated to one element and on the final day the integration of them all. In the evenings we will have restorative practices and Yoga Nidra. The most nourishing gift we can give to our nervous system. Yoga Nidra reduces stress and improves health. Suryalila is a beautiful old renovated olive farm consisting of eight houses that form the cortijo. In typical Spanish style there are two inner courtyards, one of which blooms with orange and lemon trees. The property sits on 45 acres of land and is still a working olive farm with 350 olive trees. They also grow organic vegetables and fruits and keep chickens for eggs. Suryalila is situated between the charming white villages of Villamartin and Prado del Rey. Nestled serenely in a large open valley in the foothills of the Sierra de Grazelema Natural Park. This majestic mountain range can be seen looming large on the horizon behind Suryalila. A striking part of the natural beauty of the property is the breathtaking vistas extending in all directions: rolling hills, fields of sunflowers, and lakes. The closest airports are Seville (75 min drive) and Jerez (50 min drive). Suryalila serves three beautiful vegetarian meals a day laid out buffet style in the dining room. They are renowned for the outstanding quality of their kitchen. Meals are all vegetarian and organic. Some of our products come from their own permaculture garden. We can cater for special diets and allergies providing we are given advance warning e.g. wheat free, gluten free, vegan, nut allergies. . . There is a beautiful, spacious dining hall adjacent to the main kitchen where guests can enjoy the delicious cuisine together, or find one of many beautiful shady outside spaces for dining. Flights. Please take a flight to Jerez or Seville - we will recommended flights so that group transfers can be arranged. 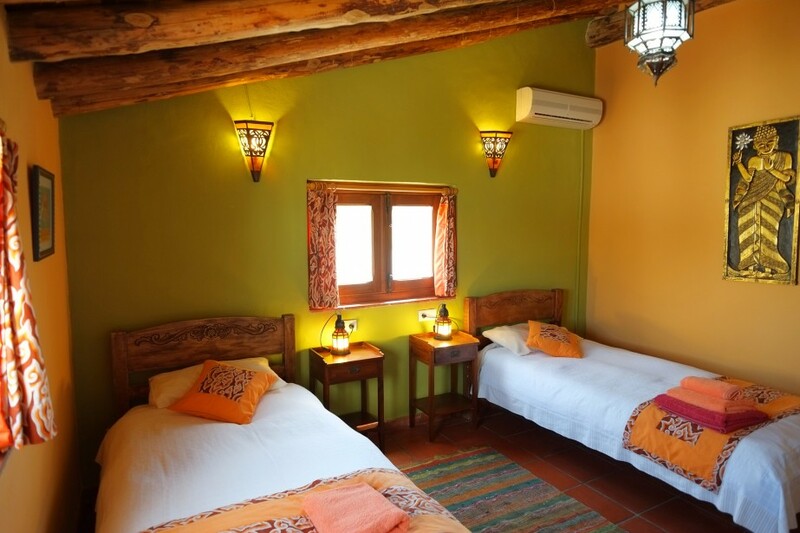 Spanish farmhouse-style wooden ceilings with beams and terracotta tiled floors blended harmoniously with exotic Asian furniture and wall hangings.